Nestled on the shores of Lake Wakatipu and surrounded by the majestic peaks of the Southern Alps, Queenstown was named because "it was fit for Queen Victoria". Today Queenstown is recognised as New Zealand's premier visitor destination and as one of the friendliest cities in the world. Queenstown's reputation as the Adventure Capital is well earned. Earth, water and air, there is something to thrill any adventure seeker. Queenstown is equally well-endowed with a great variety of relaxing activities including wine trails, art trails, museums, shopping and much more. Centrally located, Queenstown serves as a gateway to Fiordland and destinations such as Milford and Doubtful Sounds. Other destination spots such as Glenorchy, Wanaka and Arrowtown are all within an easy drive. The activity options in and around Queenstown are almost endless, whatever the weather or time of year. You can throw yourself into the many tours and adventure trips available; enjoy shopping and the constant day and night-time entertainment provided by the restaurants, pubs and nightclubs; try any one of a dozen or more sports and activities, from tramping to bungy jumping; or simply pack a picnic lunch and find a quiet spot to take in the beautiful surroundings. With the backdrop of the magnificent Remarkable Ranges and Lake Wakatipu, you can familiarise yourself with the Queenstown area by taking a trip on the Lady of the Lake, the steamer TSS Earnslaw, or ride the Skyline Gondola, which rises 446 metres up the steep slopes of Bob's Peak to a restaurant near the summit. From here, there are magnificent views over the town and across the lake to the surrounding mountains. While you are there, you can enjoy a live Kiwi Haka performance featuring traditional Maori song and dance. The cost (which includes a return gondola ride) is $26 for a child, $47 for an adult and $115 for a family (2 adults and up to 3 children aged 5 - 14 years). An unusual feature of Lake Wakatipu is the regular rise and fall of the water level - as much as 12 centimetres every 5 minutes or so. This oscillation is caused by wind, or variations in atmospheric pressure. The Maori however, have a different explanation, based on the full name they gave the lake, Waka-tipua-wai-maori, meaning 'the freshwater trough where the giant lies'. On the wooded peninsula which forms the west side of the town is Queenstown Bay, which has a garden reserve, rimmed with fir trees, roses, lily ponds, a skating rink and tennis courts, amusement park, lawn bowls and a fitness trail. There is a walk up Queenstown Hill to overlook the town, and many longer walks and tramps, such as the 3 hour Sawpit Gully track. It is also the base for the Queenstown, Hollyford and Routeburn Walks, which take 2 or 3 days through rich beech forests and natural wilderness. Golfers will enjoy playing a round on one of the most picturesque courses in the world, Kelvin Heights. A water taxi is a novel way to start, and takes much less time than driving around the lake edge. First time white water rafters will enjoy the Kawarau River, with its stretches of quiet water broken up by 4 rapids, after which the rafters shoot down the Shotover. Queenstown is suited to wandering. Stroll through the narrow streets, or to the compact town centre of shops, boutiques, courtyards, restaurants and century old buildings of timber and stone. Most shops are open every day until late each evening, and will mail goods to wherever you wish. Also in town are a kiwi and birdlife park and a motor museum displaying old cars back to 1861. For more excitement, take a jetboat ride up the Shotover River, and admire the skill of the driver as he powers his boat up the narrow gorge. 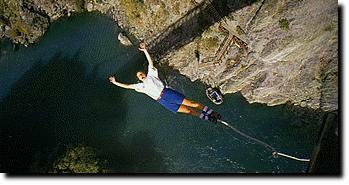 Or you can try bungy jumping from bridges across the Kawarau River, and Skippers Canyon, flinging yourself head first with an elastic bungy cord tied to your feet. For an aerial perspective, take a scenic flight over Queenstown, or westwards over the mountains of Fiordland to Milford Sound. Like many other towns in this part of the South Island, Queenstown was originally a goldmining centre. Gold was discovered on the Shotover River in 1862, and it became the second richest gold-bearing river in the world. Makeshift towns of tents, stores, bars and grog shops sprang up almost overnight, establishing not only Queenstown, but also Arrowtown, 21 kilometres to the north east beside the Arrow River, and many other small encampments. Arrowtown retains its old world charm today. Its main street is lined with tall mature trees planted by the early settlers, which carpet the streets in scarlet during autumn. Many of the original stone and wooden buildings still stand, and within them are delightful shops, restaurants and cafes. There is also the Lakes District Museum and Granny's Cottage. The way up the Shotover was difficult because of the precipitous rocks that hemmed it into a narrow gorge, the Skipper's Canyon. Undaunted, the miners constructed a spectacular, dangerous and winding bridle track for their horses, which is now the Skipper's Road. Be warned: most rental companies will not insure their vehicles for the road up Skippers Canyon. You'll enjoy the experience far more by taking a bus or 4 wheel drive excursion. Chimneys and foundations are reminders of the many buildings that once lined the road. At Pincher's Bluff, road workers were lowered down the cliff face to forge a road through with only hammers and chisels. A suspension bridge, 100 metres over the river bed, leads to an abandoned township, which in the 1860s was a thriving goldmining settlement. Some of the buildings are being restored by the Department of Conservation, and the original schoolhouse has recently been completed. The area is a museum of mining relics, and the early settlers planted more traditional English trees. At the head of Lake Wakatipu, 40 minutes from Queenstown, is Glenorchy. This small town is a great base for the outdoors. The Dart and Rees Rivers both drain into the lake, offering fine lake and river fishing. Fishing gear can be hired to guided or approved fishermen, and the season is open all year. Expert guides can arrange hunting trips for deer and goats, and there is duck shooting in season. You can try horse trekking, maybe combined with a fishing or canoeing trip. From October to December, windsurfing conditions are so good that world records have been set here. 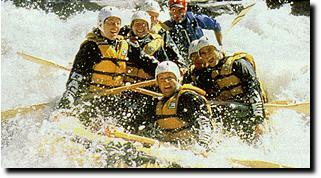 There is also canoeing and water skiing, and some challenging nearby peaks for climbing. But best of all, the town is near to some of the finest walking tracks in the world. Across the river mouth, at Kinloch, is the start of the Routeburn Track, a 3 day trek which leads over the Harris Saddle Pass to the Fiordland and Mount Aspiring National parks. There is also transport to the Caples, Dart and Rees Valley walks. Queenstown is an ideal base for skiing. Two major skifields are only a short drive away. Both have excellent facilities for skiers and snowboarders, including equipment hire, restaurants and acfes and ski schools. Coronet Peak, the more established area, has its best skiing from July to September. It is 15 kilometres from Queenstown up a sealed access road. There are groomed slopes and trails to suit beginners to experts, and deep powder in the back bowls. Night skiing will be a novel experience for many. The base facilities are designed for year round use, with the alpine slide and main chairlifts operating throughout the summer. The Remarkables are ideal for children and beginners, but there are enough steep chutes and drops to challenge any expert. It is one of the few commercial ski areas in new Zealand also offering cross country and Nordic skiing. 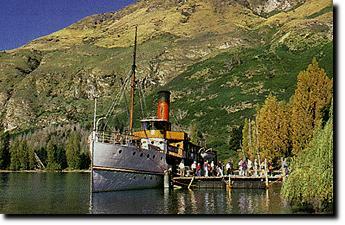 Queenstown has many other attractions and activities to enjoy. The best idea is to visit one of the information and ticketing offices in the town, select what appeals most, and plan your time to suit. 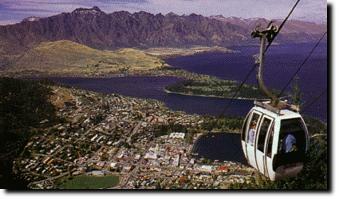 Of course, you can use the information in these web pages to help you plan your visit to Queenstown. There's one thing that most visitors to Queenstown find there's not enough of, and that's time. So, make sure you make time to enjoy all that this unique town has to offer.